Lemon-marinated lamb tenderloin, served with a kefir and cream sauce. Inspired by Mediterranean cuisine, this recipe is flavorful and tangy. 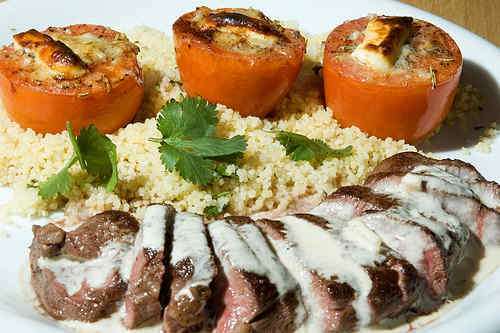 In the photo, the lamb tenderloin is served with grilled tomatoes and couscous and garnished with a bit of cilantro. Crush garlic and combine with olive oil and 1/8 tsp of lemon juice, making a smooth paste. Add pepper and lemon zest. Rub the lamb tenderloins with the marinade. Marinate under refrigeration for a few hours. Wipe off excess marinade. Set frying pan over high heat, add oil and fry the loins 1½ - 2 minutes per side (for rare to medium-rare). Wrap in aluminum foil and let rest for 5 minutes before slicing. Reduce heat, deglaze pan with lemon juice. Carefully stir in kefir and cream. Season with salt and pepper. Slice lamb across the grain into ¼ in / ½ cm thick slices. Sprinkle meat with a bit of kefir and cream sauce. Serve hot (warmed plates are best). If you like the cream sauce less tangy, substitute half of the lemon juice with water. Yields 2 - 4 servings. While searching for recipes including kefir, this one came up. The best looking one I have found so far! I will definately be searching through your site for more recipes. Thank you.